Excited to celebrate Spring 2010? 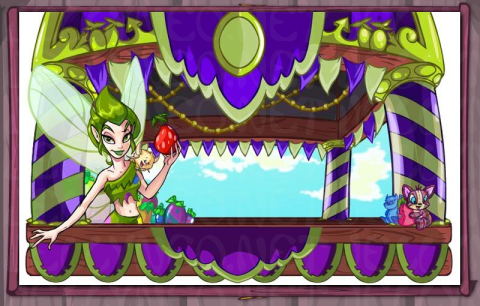 Well, you're probably not as excited as Kari, the Negg Faerie. :P With the help of her Neopian pals, she has created the Festival of Neggs in honour of the new season as well as the approach of Easter! The NC Mall is also getting in on the action. To see our Neggstravaganza Surprise guide, click here! To set Neopia abuzz with activity, Kari has a few goodies and some super awesome quests! The Festival of Neggs will last from March 15th to April 12th. Since there are NP prizes, please do not participate in this on your side account. You can collect one free prize every day until the end of the Festival of Neggs. You might receive an item or some Neopoints. Simply visit the main Festival page to claim yours! If you're very, very lucky, you might receive a special item when you visit the main Festival page. It will show up as a notice at the top of the page. There are also new quests available for you to complete. These are not released on a daily basis, so keep checking back. You'll receive exclusive items for your hard work. You begin a quest when you click on the "Start" button and receive a clue. You can choose to pause a quest (your progress will be saved) if you want to start on another; however, you can only have one active quest at a time. Quests can be completed in any order. 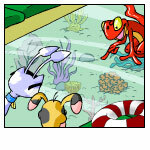 Internet Explorer has been known to have glitches and display issues when it comes to playing Neopets. If you encounter difficulties during your quest, please try a different browser (Firefox is the most recommended). It might be a good idea not to use Internet Explorer when doing future Neopets events or plots. 8 - A I'd really like to go on holiday after the Festival has ended, though even that is unlikely with how busy I am. I definitely won't be able to get away to do any of the scouting. Would you check out a few Neopian destinations in case I can get away for a quick trip? Also, make sure you bring me things to let me know why I should choose that location. Let's see... considering how busy I've been at the Festival, maybe it would be a nice change of pace to visit a place that is less populated, archaic even. I am also quite passionate about landscape painting. Perhaps there is a place that I can visit that will give me a little time away as well as let me enjoy some beautiful scenery. As for the rest of my possible destinations, I'm sure you can come up with a few good ideas... Go to the Tyrannian Cave Painting page and click on a painting (if you hover over each painting with your mouse and look in the bottom left of your browser window, the one that you want to click on has a long string of gibberish numbers and letters in the web address). 8 - B That's quite a painting you've got there... it's for Kari, you say? I had no idea she was a patron of the arts. I have heard, however, that she's a rather sporty type. And what better place to enjoy a nice sporting event than on the beaches of Neopia. Just keep an eye out for those Turdles. Don't worry about the painting - I'll see to it that it's delivered. As for you, here's a souvenir to remind you of your time here during the remainder of your voyage! Play Mynci Beach Volleyball and send a minimum score of 250 points. 8 - C Whew! After a match like that last one, I sure could use something to eat. Care for a bite? I've got an extra Zeenana in my bag; you're welcome to it. I see-not a fan, eh? Maybe you will enjoy some cheesy crackers instead. This Island food's okay, but it's nothing compared to the sweet ambrosia of my favourite land... oh well, even if the food's not so great here, the lovely views Mystery Island has to offer are certainly a selling point! Visit the Exquisite Ambrosia shop and purchase Altadorian Ambrosia (refreshing may be required, NP not actually deducted from you). 8 - E As you might have imagined, I just absolutely love ice cream! To be honest with you, though, whenever I think about being trapped in that factory, it definitely makes me wish for a change of scenery... Visit the Mystical Surroundings shop, buy a background (this is a real restock, so you have to go through actual restock steps), customise it on your active pet, then go back to the shop. 8 - F Picking up a souvenir to remind you of your time in Qasala, eh? Beats living with this sweltering heat every day, that's for sure. There's one good thing about the weather here, though-getting a nice tan isn't too difficult. Laying out, however, can be awfully dull unless you've got something to keep you entertained... Visit Sutek's Scrolls and buy Things to Do In Sakhmet (refreshing may be required, NP not actually deducted from you, book is not awarded to your inventory). 8 - H Upon closer examination, you notice some very faint and worn symbols on the key that look familiar. Perhaps you should explore Neopia's lands to figure out what this key might unlock? Go to Coltzan's Shrine. There are 4 clickable symbols on the shrine that each produce a different sound (clicking, grinding, hissing, or knocking). The rectangular hole is the 'reset' button. You must find a pattern of sounds that will lead you into the shrine. Click on each of the 4 buttons first to see what sounds they produce. Then click the reset button. Try to get this pattern: grinding, hissing, clicking, knocking, grinding, hissing, knocking. If that does not work, the easiest strategy is just to start clicking the symbols randomly (and don't click the reset button). A hidden door opens in the side of the shrine! Where could it lead? Click the "Where could it lead?" link. 8 - I You have found the long-lost King's Key and discovered a place traversed by few. Choose your path wisely, brave Neopet. One wrong move and you could be banished to the beginning. Find the correct path, and you will enter a place that is known only by the most enlightened. Navigate through the tunnels (if you go down the wrong tunnel, you will end up at the previous map, so keep track of where you have been). Eventually, you'll make it out and discover the mystical desert oasis. 8 - J Congratulations! 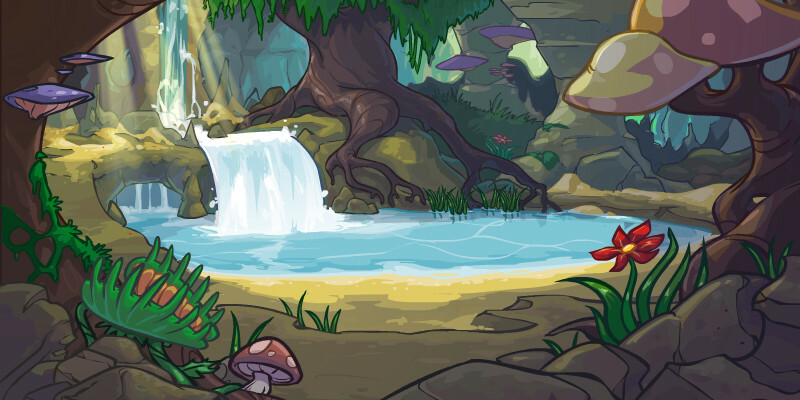 You have discovered a mystical desert oasis hidden deep within Neopia. This will surely be the ideal destination for Kari's much deserved holiday. Please inform her of its beauty and tranquillity. You have done well. Your efforts will most certainly not go unrewarded. Head back to Kari. 7 Can you find a plastic Negg based on this clue? Your search for a plastic Negg could take you: To the land that won the first Altador Cup Or two lands that have never left the 1st Round Or a land that doesn't even have a team. The riddle wasn't too tricky, was it? I didn't think so. Still, you've earned a reward for your time. Don't forget that you can exchange these Neggs for more powerful ones at the Neggery. My assistant will be able to help you while I am still here at the Festival. Wander around the different locations on Haunted Woods (including Deserted Fairgrounds and Neovia), Neopia Central (including Bazaar and Plaza), Terror Mountain (including Caves and Mountain Top), and Virtupets Space Station (including Hangar and Recreation areas). 6 - A The Tooth Faerie stopped by my booth yesterday, and we were exchanging recipes. I had just given her the recipe for my Speckled Negg Stew when we were rudely interrupted. She left without giving me her recipe, and I would very much like to make a batch of her Tooth Faerie Cupcakes, only now I don't have time to track her down. Would you go fetch the recipe for me? 6 - B Hi there! Warm day, huh? If you're looking for the Tooth Faerie, she was here earlier. Check out these pearly whites! *wink* As for where she was heading next... gee, I can't remember what she said now. Our conversation was kind of confusing; it seemed as though we were talking in circles. We just kept going 'round and 'round... it felt like we said the same thing four times. Anywho. Sorry I couldn't be of more help. Here, take this toy; it will give you something to play with as you search for her. Good luck! Go to the Roo Island Merry Go Round and go on four rides. All your pets must ride at least once. 6 - D Oh no, not you too! Oh wait. I saw your sea shell and jelly collections and thought you had another so-called Jelly Shell like the one that the Tooth Faerie brought me! She left it here for me to investigate its origins, but frankly, I can't figure it out. Here, take it. Maybe you can figure out what it actually is. Be sure to put it in a very safe place; otherwise, you never know what could happen to it... Go to the Collectable Sea Shells shop with a SHELL and JELLY item. The Jelly item should be in your inventory and the Shell item should be in your Sea Shells Album. Click on the "Inventory" link when you are given the prize. You will be taken to a maze. Guide your pet through the maze using the arrow buttons and find the petpets. 6 - G Whoa, whoa, you've got to get out of here! There's no time for shopping. Sure, I've seen a faerie around here, but never mind that now! THE JELLIES ARE COMING!!! RUN!!! Play Scourge of the Lab Jellies and send a minimum score of 1000 points. 6 - H It's a good thing you showed up! If you hadn't defeated all of those Lab Jellies, I'd still be stuck in that laboratory. Let me give you some advice: Never offer to clean the teeth of anyone working in a Jelly Lab who can't control his experiments. Now, why were you after me again? Oh, of course, the cupcake recipe! Here, let me write it down for you so you can take it back to Kari. Pardon me, but now I must get back to work! Head back to Kari. 6 - I There you are! Please tell me you found the Tooth Faerie. You did? Good, now I can finally make those cupcakes. Where did you finally manage to track her down, by the way? Jelly World? No really, where? Fine, you don't have to tell me. Anyway, here is your reward, as promised. Do a victory dance! 5 I'll be impressed if you can figure out this one. Would you like to try? Even though that was pretty easy, you still deserve a reward for figuring out the riddle. Here you go. Wander around the different locations on Altador, Meridell (including Darigan Citadel), Shenkuu, Faerieland (including Faerieland City), and Brightvale. 4 - A Jhudora just sent a note via her Bartamus, demanding one of my special Neggs, and that vile Petpet almost bit me! Still, it's quite clever how she has him trained to deliver messages. Maybe I should get my own Petpet to help me out... but this Negg order won't fill itself, and Jhudora doesn't like to be kept waiting. Could you go find me a Petpet? OK, I know exactly what I want. I need a Petpet that can get around the Festival easily, so it has to be agile. And sometimes I work until all hours, so make sure he can still be helpful when it's dark. One more thing: make sure he doesn't make too much of a mess. I have enough to worry about around here without having to clean up goo. Head over to the Spooky Petpets shop to receive something to help you catch that pesky petpet. 4 - B Hmmm, from your description, it sounds like Kari is looking for a glowing Slymook. They make wonderful Petpets once they are trained, which is maybe why they are so very rare. I don't often have them in stock, but maybe you will have good luck finding a wild one in the Haunted Woods. You could try catching one. Here, take this food. It might help. 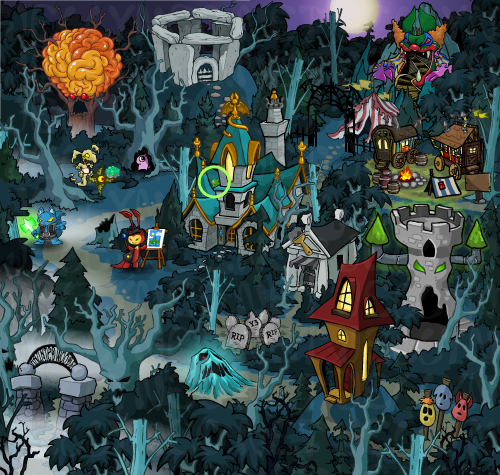 Wander around the different locations on the Haunted Woods map and check the Halloween Paint Brushes page periodically until you see the Glowing Slymook notice. You might have to revisit places several times, but keep checking the Halloween Paint Brushes page. 4 - C You spot a wild glowing Slymook, but it scampers back into the woods before you can catch it. Its trail of slime appears to be leading here! Click on the "here" link in the clue to go to a special version of the Haunted Woods map. Now the fun begins! Look for the tiny, eensy weensy Glowing Slymook in the map (click on the "Keep Looking" button to refresh the map). The Slymook is really small. If you have trouble spotting it, try zooming in (usually, this is done by going to View -> Zoom -> Zoom In), but make sure to zoom out or reset zooming to normal when you're ready to click on the Slymook. You got one, but he managed to slip away! Try again. They say, "Third time's the charm," but apparently not in your case. That goo makes it almost impossible to hang on to one. Keep trying! 4 - D You finally manage to grab one for more than a few seconds. You had better hang on! As you travel through the Haunted Woods on your way back to the Festival, you stumble across a book lying on the ground. As you reach down to pick it up, the Slymook wiggles out of your grasp. You see him scamper off, heading for the Deserted Fairground. That's no place for a Petpet. It can be dangerous with all of those custard pies flying around. You'd better follow him. Play Carnival of Terror and send a minimum score of 300 points. 4 - E You may have managed to save the Slymook from us, but don't get too full of yourself. While you were wiping that pie off your face, I saw the Slymook slip away again. My database tells me that when they get really scared, sometimes they like to hide. I just hope that he doesn't get eaten! Muahahaha! It will be fun to watch you tromp through the woods trying to catch him. Head to the Esophagor (do not accept an Esophagor quest, just visit him for the next clue). 4 - F IIIIIIII kkkknnnnnooooowww wwwwhhheeeerrreeee tttthhhheee Ssssslllllyyyymmmmoookkkssss hhhhiiiidddeeee, bbbuuuttt yyyoooouuu mmmuuusssttt bbbrrrriiiinnnngggg meee aaaa sssswwwweeeettttt tttrreeeaaatttt, fffoooorrrr IIIII aaaammmm HHHUUUNNNNGGRRRYYYYY! Visit the Crumpet Monger, refresh until the Cinnamon and Sugar Scone shows up (it might be somewhere in the middle or bottom of the stock). Click on it. 4 - G That is certainly one of our most popular desserts! I am sure that will satisfy the Esophagor's hunger... for now. Go back to the Esophagor. 4 - H MMmmmmm, ttttthhhaaaannnnkkkk yyooouuu. IIIIIII cccccaaannnn tttteeeellll yyyyooouuuu ttthhhhaaatttt kkknnnooowwwllleeedddgggee cccaaaannn oooffffttteeennnn bbbbeee hhhheeeaaarrrrddd wwwhhhiisspppeeerrriiinnnggg ttthhhrrrooouuugggghhhh ttthhhheeee ttttrrreeeeeeessss... Visit the Brain Tree. 4 - I You do not come to me to ask questions; I ask the questions! However, it appears that you have been on a very long journey. If it is the location of that glowing Slymook you seek, solve this puzzle and the answer will be revealed to you. Click on the "this puzzle" link to be directed to a jigsaw puzzle. Drag the pieces around to complete it. 4 - J You have successfully solved the puzzle. It appears that you have been directed to return to the quest booth from which you were sent. Perhaps your efforts have been fruitless. Here is a small token for entertaining me. Head back to Kari. 3 Here's a little riddle I've come up with. Can you solve it? Can you find where I've hidden the Blue Plastic Negg? Wander around the different locations on Kiko Lake, Krawk Island, Maraqua (including Maraquan Ruins), Mystery Island (including Geraptiku), and Roo Island. You seemed like a smart Neopian. The first ingredient I'll need is a delectable fruit that can only be found in one place. You know, it's true what they say about the enlightened farming methods of King Hagan's subjects. They sure put their wisdom to good use! I don't have time to go over the rest of the ingredients, but I am sure you will figure it out along the way. Head over to Brightvale Fruits and purchase the Cackleberry (refreshing may be required, NP not actually deducted from you). 2 - B Ahh, let me guess... doing a little shopping for Kari, eh? Pretty much the only time that those Cackleberries sell is when she's cooking a pot of her delicious Speckled Negg Stew. I take it you'll be heading north from here, then? After all, what's a Speckled Negg Stew without a wheel of Bubbling Snot Cheese? Visit Cheeseroller. You will need to buy (and win) Bubbling Blueberry Cheese and Gooey Snot Cheese from the Techo. (Strategy for the game: always Dive Left.) After winning the cheeses, mix them both in the Island Cooking Pot. 2 - C Those ingredients that you put in my cooking pot were rather... extreme. You got them in Meridell, you say? I guess that's no surprise; they've got some pretty radical ideas about food. I have to give them credit, though - that ratio they've come up with for making stew... I believe it's x minus four, multiplied by three, where x equals the number of your vegetable of choice? Brilliant! Play Extreme Potato Counter. Count the potatoes in Level 1. Take that number and subtract 4, then multiply that by 3 and enter the total as your guess. For example, if you count 7 potatoes, enter 9 as your guess. 2 - D Whoa, duder! These ingredients you've got are pretty gnarly! I'm sure that they'll make a most righteous stew. If you really want to crank up the heat on your recipe, there's this one dude... uh, y'know... *tilts head and, shading eyes, glances toward the sky* ...anyway, yeah - find that guy. He's got a rockin' ingredient that'll spike your taste buds! But here, take these potatoes back to Kari. She will totally need them for her awesome stew! Head over to Cellblock and click on the rightmost nostril of Guard One - Galgarrath. 2 - E So I see you have come for my infamous Stew Spice. The guards and I use it to help make the slop that they serve here in the dungeon edible. I imagine that if it makes our stew tolerable, it will do wonders for whatever Kari is concocting. Take it back to her, just don't upset the prisoners on your way out... Head back to Kari. 2 - F I thought you would never get here! I've been waiting for those ingredients for hours. All right, let's have a look... hmm... okay... well done! It looks as though everything's here. Well, I'd better get cooking; there's hardly a moment to spare... oh, right, of course! Just a moment... here you go: Breathe a sigh of relief! 1 Do you think you can solve this little puzzle of mine? And the kind that turns to sand. Can you find where I've hidden the Red Plastic Negg? Wander around the different locations on Kreludor, Tyrannia (including Tyrannian Plateau), Moltara (including Moltara Caves), and the Lost Desert (including Sakhmet and Qasala). Awarded to users who completed all 8 quests (each quest completed before the next was released) in the 2010 Festival of Neggs.